Load Binders & Cargo Restraints have a spring loaded ratchet buckle that is designed for fast tensioning and easy release. 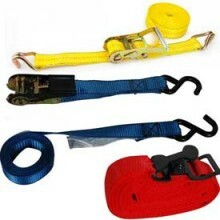 Simply pull webbing through ratchet tie down roller to take up slack. Click the button below to add the Starp Binders to your wish list.